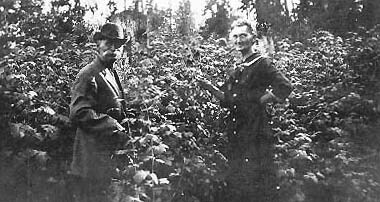 Equality Colony, the home of Edwin Levi and Sarah Jane (Pelton) Irish and their children, was a socialist community located on Colony Creek, eight miles south of Bellingham in northwest Skagit County. "Our purpose is to readjust measures and systems to the changed conditions of the social and industrial life . . . to give the people industrial as well as political freedom." The effort was recognized by such well-known socialists as Eugene V. Debs and Henry Demarest Lloyd. The founders of the Brotherhood taxed themselves and also required a membership fee of $160 per family, soon raising $10,000 to buy 200 acres of land in 1897 near the town of Edison on the Skagit-Whatcom border. *G.E. (ED) PELTON, leader of the first group of Northwest socialists, named the colony Equality from the title of a book by Edward Bellamy. Extensive buildings were constructed by the enthusiasic colonists; two large apartments, a barn, storeroom, printing office, root house, bakery, sawmill, dining room and kitchen, cereal and coffee factory, copper shop, blacksmith shop, public school, milk-house, and even an apiary. Significantly, there was no jail, no saloon, no police force. Food raising was the main project, and the fertile Skagit delta was generous in its bounty. The colony acquired a fishing sloop and added seafood to its diet. All went beautifully until after 1900. Members lived in large apartments, later in individual homes. Each person was allowed to choose his occupation but also had to agree to work at other assigned jobs if he had spare time. All policy was decided at the frequent town meetings, which everyone over eighteen was required to attend. Equality's political publication, "Industrial Freedom", was circulated nationally. Because the colonists behaved themselves, their neighbors liked them even if their way of life was different. Everything was, indeed, utopian for about four years; then, in succeeding years of the new century, matters worsened. Ideological disputes turned the town meetings into impossible wrangles. Professing socialist fever, freeloaders joined the colony to tap the abundant food and supplies. In early 1906, a fire set by arsonists destroyed several buildings, including the barn and most of the cattle inside. Declaring that taxes were delinquent and a reign of terror existed in the colony, a group of colonists petitioned the court in Mount Vernon to place the Brotherhood under receivership. The land was then sold, the assets distributed, the colonists scattered, proving the previously declared tenets of the national socialists - that cooperative living simply did not work....."
**G.E. "Ed" Pelton was the brother of Sarah Jane Pelton, wife of Edwin Levi Irish! "A look at Washington's pioneer labor reform press -when journalism met activism"
"... E.B. Ault, who as a teenager at Equality Colony had edited Industrial Freedom and the Young Socialist,...."